Frank Thomas, one of the most talented, inventive and influential animators in the history of the art form, a member of Walt Disney's elite “Nine Old Men,” and a pioneering animator who worked on many classic shorts and features during his 43-year career at the Disney Studios, passed away on Wednesday (9/8/2004) at his home in Flintridge, California. He was 92 years old. BURBANK, Calif., Sept. 9 /PRNewswire/ -- Frank Thomas, one of the most talented, inventive and influential animators in the history of the art form, a member of Walt Disney's elite “Nine Old Men,” and a pioneering animator who worked on many classic shorts and features during his 43-year career at the Disney Studios, passed away on Wednesday (9/8) at his home in Flintridge, California. He was 92 years old. Thomas had been in declining health following a cerebral hemorrhage earlier this year. In addition to his achievements as an animator and directing animator, Thomas (in collaboration with his lifelong friend and colleague Ollie Johnston) authored four landmark books: Disney Animation: The Illusion of Life, Too Funny for Words, Bambi: The Story and the Film, and The Disney Villain. Thomas and Johnston were also the title subjects of a heartfelt 1995 feature-length documentary entitled “Frank and Ollie,” written and directed by Frank's son, Theodore (Ted) Thomas. Born in Santa Monica, California, Thomas moved to Fresno with his family at an early age. At Fresno State College, he became president of his sophomore class, and wrote and directed a film spoofing college life for a school project. The film won much acclaim and was run in the local theaters, where it earned a profit that was contributed to a school fund. That project sparked Thomas' ambition to go seriously into the arts in some form. His father promised to send him to an art school of his choice if he would finish his education at Stanford. At Stanford, Thomas majored in art and won recognition for his cartoons for the school newspaper, Chaparral. During his Stanford years, he met and became friends with another art major, Ollie Johnston. The two formed an instant friendship that was to last for over 70 years. Thomas made animation history as a key member of the animation team on “Snow White and the Seven Dwarfs,” Hollywood's first full-length animated feature. He was one of eight animators who concentrated on the dwarfs in three sections of the film. This was followed by a top spot animating the title character in “Pinocchio.” Thomas helped to design the character and did some outstanding animation on such scenes as the “I've Got No Strings” musical section. For “Bambi,” Thomas experimented for over six months to get the proper look and characterization for Bambi and some of the other animals. 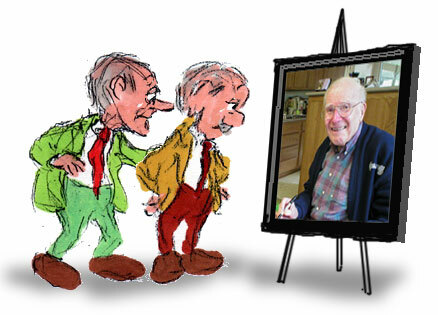 He worked “hand in glove” with fellow animator Milt Kahl to solve some tough design and animation problems. In 1941, Thomas joined Walt Disney and a contingent of 18 artists, and storymen from the Studio on a goodwill trip to South America. He was the only animator in the group that toured Brazil, Argentina, Peru, Bolivia and other countries. Two films, “The Three Caballeros,” and “Saludos Amigos,” resulted from the trip. For the 1949 feature, “The Adventures of Ichabod and Mr. Toad,” Thomas was promoted to directing animator and handled the scene with the superstitious Ichabod riding home on a dark and scary night. He made the switch to villains, starting with “Cinderella,” for which he animated the wicked Stepmother. This was followed by a star turn animating the Queen of Hearts in “Alice in Wonderland.” Next came the nefarious Captain Hook in “Peter Pan.” Thomas designed and supervised this colorful character with the fiery temper. Thomas struck a romantic note with the classic scene of a cocker spaniel named Lady and a rover named Tramp sharing spaghetti and meatballs on a “Bella Notte” in the 1955 feature, “Lady and the Tramp.” He went on to animate (with Ollie Johnston) the three good fairy characters for “Sleeping Beauty” and the lead adult dogs in “101 Dalmatians.” Thomas had one of his personal favorite scenes in “The Sword in the Stone,” where a love-struck squirrel encounters the once and future king who is temporarily inhabiting the body of another squirrel. He went on to serve as directing animator on “The Jungle Book,” “The Aristocats,” “Robin Hood,” and “The Rescuers.” After working on some early story development, character design, and animation for the 1981 feature, “The Fox and the Hound,” Thomas retired from animation in January, 1978. Over the next five years, Thomas and Johnston devoted full time to researching and writing the definitive book on their craft, Disney Animation: The Illusion of Life. The book distilled forty years of knowledge and experience into what many consider the finest book ever written about animation. Too Funny for Words was published six years later and explored the gags, humor and story elements that went into the features and shorts. Walt Disney's Bambi: The Story and the Film (1990) told the behind the scenes story of the creation of one of the greatest animated films of all-time. Their final collaboration, The Disney Villain (1993), explored the richest and most colorful rogue's gallery in film history. In addition to his career as a top animator, Thomas also expressed his musical talents as the piano player in the popular jazz group, The Firehouse Five Plus Two. Formed in 1940s, the group consisted of other Disney employees, and achieved success with their numerous Dixieland jazz recordings and personal appearances. They officially disbanded in 1971. In 1995, Thomas was the subject of a feature length documentary, “Frank and Ollie,” released by Walt Disney Pictures. Written, produced, and directed by Frank's son, Theodore (Ted) Thomas, and produced by Ted's wife, Kuniko Okubo, the film played film festivals around the world and received acclaim for its insightful look at the lives, careers and extraordinary friendship of the two legendary animators. Thomas is survived by his wife of 58 years, Jeanette; son Theodore and his wife, Kuniko Okubo; son Doug, and his life partner, Dan Poirer; son Gregg and his children, Ukiah and Micah; and daughter, Ann Ayers, her husband, Andy Ayers, and their son, Marshall. No funeral is planned but details regarding a life celebration will be announced shortly. In lieu of flowers, the family suggests that donations be made in Frank's name to the Character Animation Program at CalArts (California Institute of the Arts) in Santa Clarita, California.